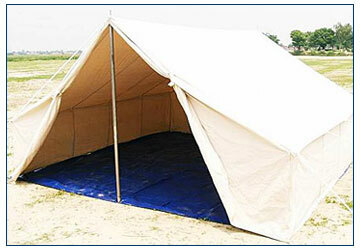 Cotton Canvas Tents are single / double fly tents made out of waterproof canvas cloth. The outer fly extends beyond the inner fly on two sides and hoods are provided for extra protection to the inner fly. 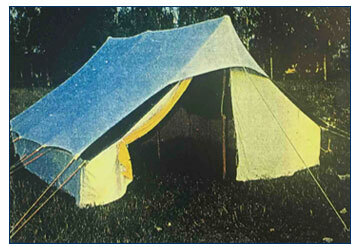 The tent is supported by ridge poles that give a central height to 6 FT and a wall height of 2 FT.
• Made out of chemically processed Cotton Canvas. • Outer fly is made of 700gsm cotton canvas which is water proof & rot proof. • Centre height of 6FT along with Wall height of 2FT. • Includes all Accessories such asÂ pins, pegs & hammer. • Colour : Military Green.